How to clean and season cast iron cookware instructions are given here as castiron cookware needs extra care before you start using it for cooking their food. Just washing is not enough. Cooking in cast iron cookware is considered an healthier option compared to non stick cookware. These instructions will work for all kinds of cast iron as well as iron cookware. You may have bought a new cast iron pan or you may want to use an old cookware that you inherited or that has been lying around unused for sometime. These cleaning and seasoning instructions work for both kind of cookware. I have some cast iron cookware that I have been using using for quite some time. 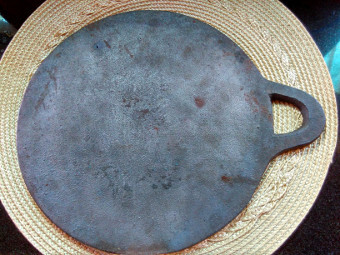 This flat cast iron dosa/pancake tava, in the image below, I use it regularly. It has become nonstick after washing and seasoning. I have received questions about cleaning and seasoning cast iron cookware. Today I am cleaning and seasoning a new cast iron tawa. These instructions work for new cast iron cookware or old rusted cookware. People have been using the convenient nonstick cookware and finding that the nonstick coating gets damaged after some use. Even when the nonstick coating is good, it is not considered good for our health. Many people are now going back to the old fashioned healthy cookware, cast iron, stone or clay cookware. Cleaning Powder or cleaning liquid or detergent that you normally use. 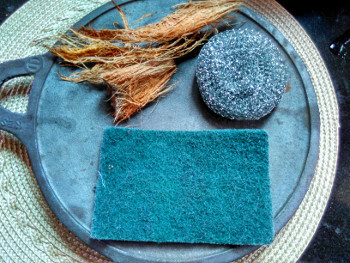 A scrubber, you may use steel wool or plastic scrubber. Or you may use the old fashioned coconut husk too. See the image below. Your tava may be new or old but rusted. If it is rusted, you may need to use a stainless steel scrubber to rub and loosen and remove the rust. You may need more time and efforts to remove rust. Wash tawa with soap and hot water. You may use detergent or anything else that you normally use to wash. Put some cleaning powder and water on the tava. Use a scrub to spread it on both sides of the tava and keep aside for 5-10 minutes. Scrub well the whole tava, especially the place with rust spots. Wash well and see if all the rust spots are gone. If not, use cleaning powder again scrub vigorously the rust spots. Do this till all the rust, if any, is removed. After washing finally, wipe and dry with a kitchen cloth. Now we will do the seasoning of our cast iron tava. Cooking oil that you normally use. 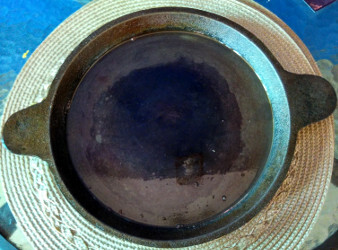 After washing well and removing dirt as well as rust, dry the cookware well with a kitchen cloth. Pour a little cooking oil on the cookware and spread it evenly on the surface with a brush or a tissue paper or your fingers. Keep the cookware on the stove and heat it on low flame. Heat till it starts smoking. Switch off the flame when it starts smoking and let cool naturally. When completely cool, wash again, dry well and apply oil as before. Heat on low flame. Once heated cook a chapati or dosa/pancake on the tava. You need not use this first made chapati or dosa. 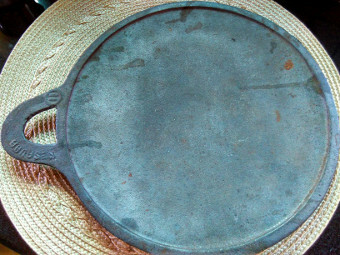 Your cast iron tava is ready to use. Make dosas as you wish for your family. 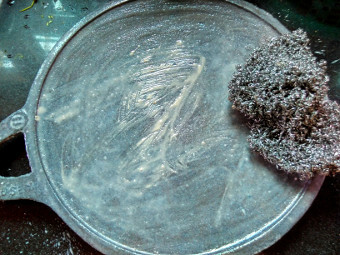 There is no need to wash the cast iron tava every time if you use it frequently. Just wipe with a tissue and it is ready to use. If you wash it after some use, dry well, apply oil and store. 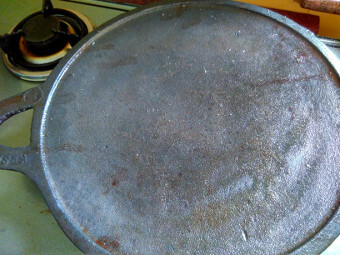 There should not be any water remaining on the cookware as it will start rusting again.